The mountains of North Carolina at the end of the 1920s: George (Bradley Cooper) and Serena Pemberton (Jennifer Lawrence), love-struck newly-weds, begin to build a timber empire. Serena soon proves herself to be equal to any man: overseeing loggers, hunting rattle-snakes, even saving a man’s life in the wilderness. With power and influence now in their hands, the Pembertons refuse to let anyone stand in the way of their love and ambition. However, once Serena discovers George’s hidden past and faces an unchangeable fate of her own, the Pemberton’s passionate marriage begins to unravel, leading toward a dramatic reckoning. 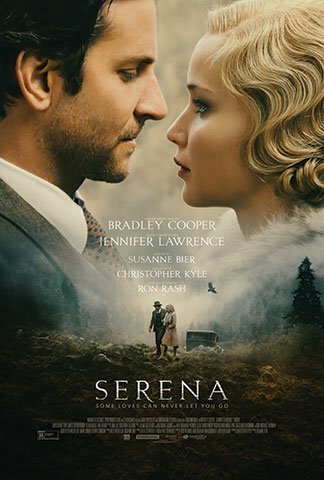 Directed by Susanne Bier, Serena was adapted from the Ron Rash novel by screenwriter Christopher Kyle. Producers are Susanne Bier, Nick Wechsler, Steve Schwartz, Paula Mae Schwartz, Todd Wagner, Ron Halpern and Ben Cosgrove.